7.73 points at 22 votes (rank 146). 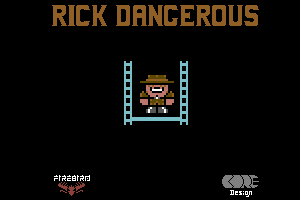 Rick Dangerous is a Jump 'n' Run game, where you need to get Rick through four levels with altogether 80 rooms, that are larded with numerous (74) different traps and enemies. You can lay down explosives to bomb away enemies or boulders, shoot with a pistol or "freeze" the enemies for a few seconds with the help of a wooden stick, which although in most cases is not much help. The shots and explosives are each limited to 6. However, you can find boxes of ammunition in hideouts to refill them. The case history, (Rick, the fearless adventurer is searching for the lost Goolu temple, which he will find, but not in the way he had imagined), was enclosed as a comic. The scans can be found on the C64-Games website under "Manual". 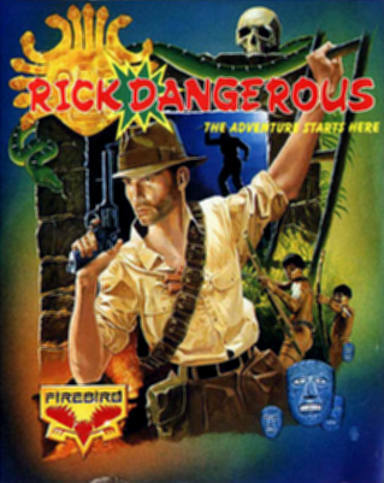 Interestingly there are some similarities between Rick Dangerous and the known Tomb Raider series. The producer is Core Design and also the plot (archaeologist searches for artefact) is similar. The successor Rick Dangerous II is - concerning the controls and the game principle - very similar to part 1, but plays in a futuristic scenario. The game starts with a small introduction. The graphics of the caves are done neatly, the sprites partly seem a bit bold. The scrolling is a bit unusual. Only when Rick gets close to the rim of the screen, the screen scrolls for about half a screen in the corresponding direction. During this time the movement of all sprites gets "frozen". Sound and music are only sparsely used. The combination of the traps are sometimes a bit mean, as they cannot be seen beforehand. Pixel exact jumping and good timing are necessary. At the end of each level a small puzzle awaits you. The dynamite can be layed down to release traps, bomb away walls, blow up enemies or in general cause damage so Rick can continue his adventure. But beware: As soon as it has been lighted, Rick must quickly take to his heels before it detonates. At the start Rick has 6 bars of dynamite. The pistol is to be used for shooting (what else for?). However, the magazine only holds 6 shots. When shooting a villain sometimes a bonus is lef behind, that fills the magazine up. This can mean that Rick needs to get back to the scene of action. Remember that shooting the pistol could activate a trap in some situations and can harm you more than an enemy. Try to avoid the traps cleverly, because they are deceptive. You never can tell beforehand how a trap can be activated or avoided. So be careful as in many cases appearances are deceptive. / Pressing the joystick diagonally up left/right releases a jump in the corresponding direction. / Pressing the joystick diagonally back left/right makes Rick creep on the floor in the corresponding direction. The enemies and traps always appear at the same place with the same effect. 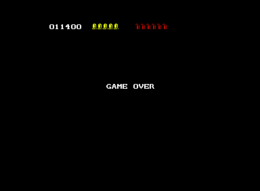 At the end of the fourth level the selector block at the middle of the screen needs to be blown up to open the exit and to end the game. Draw or get a map. 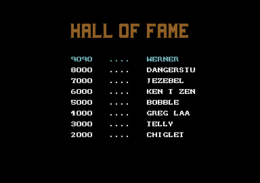 The version by "Remember" has next to a saveable highscore list also different trainers as invulnerability, unlimited dynamite, etc. H.T.W: "Funny and diversified but very tough jump'n run for people who like to puzzle, have a calm hand and fast reaction. A game according to the principle: this must be managable, I'll just try it once again...". mombasajoe: "The graphics are cute, the technics are good, the controls are well, there are many funny situations. This is the reason why I have played the game again and again... and due to too much try'n'error and too long levels I have put it aside again. No matter if Amiga or C64. Technically top, concerning the gameplay not mine. What a pity."